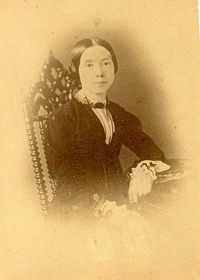 Emily Elizabeth Dickinson (December 10, 1830 – May 15, 1886) was an American poet. Though virtually unknown in her lifetime, Dickinson has come to be regarded alongside Walt Whitman as one of the two great American poets of the nineteenth century. Where Whitman represents blustering wild America, the America of frontiers and factories, full of American energy and American hope, Dickinson, with grace, with clarity, with an intelligence unequalled by any other American poet of her time, represents America's conscience. Many, in the wake of the twentieth century and its disasters, have come to know Dickinson and her sad intelligence like an old friend. Ever the recluse, Dickinson's poetry is hard to classify. She was not a public personae, so she didn't write as part of any school or movement. She wrote for her own pleasure, or to express her own private triumphs and tragedies. Often it is said of certain writers that they wrote for themselves, but she is one of the few for whom it is really true. And yet, for that reason, she was truly innovative, and decades ahead of her time, stylistically and thematically. Her poetry was not truly appreciated until decades after her death, with the advent of modernism. The independence and immediacy of Dickinson's work and her personal vision captured something uniquely American. She was perhaps the most philosophical American poet until Wallace Stevens; and in that regard, she is one of the most profoundly thoughtful poets America has ever had. Emily Dickinson was born in Amherst, Massachusetts, to a prominent family well known for their political and educational influence. Her grandfather, Samuel Fowler Dickinson (1775–1838), was one of the founders of Amherst College, whose campus stands less than a mile from the family home. Her father, Edward Dickinson (1803–1874), was a lawyer and treasurer for the college. He was also politically prominent, serving on the Massachusetts General Court from 1838 to 1842, in the Massachusetts Senate from 1842 to 1843, and in the U.S. House of Representatives (to which he was elected as a Whig candidate in 1852). His wife, and the poet's mother, was Emily Norcross Dickinson (1804–1882). She was quiet and chronically ill. William Austin Dickinson (1829–1895), usually known by his middle name, was the poet’s older brother. He later married Dickinson's most intimate friend, Susan Gilbert, in 1856 and made his home next door to the house in which Emily lived most of her life. Their younger sister, Lavinia Norcross Dickinson (1833–1899), often known as "Vinnie," encouraged the posthumous editing and publishing of her sister's poetry. Dickinson lived most of her life in the family's houses in Amherst. In 1840, Emily was educated at the nearby Amherst Academy, a former boys' school that had opened to female students just two years earlier. She studied English and classical literature, learning Latin and reading the Aeneid over several years, and was taught in other subjects including religion, history, mathematics, geology, and biology. In 1847, at age 17, Dickinson began attending Mary Lyon's Mount Holyoke Female Seminary (which would later become Mount Holyoke College) in South Hadley. When she again became ill in the spring, Austin was sent to bring her home after less than a year at the Seminary, and she did not return to the school. After that, she left home only for short trips to visit relatives in Boston, Cambridge, and Connecticut. For decades, popular wisdom portrayed Dickinson as an agoraphobic recluse. New scholarship suggests that she may not have been quite so eccentric, and may have even entertained a wide circle of friends. However, a record of Dickinson's adult life is almost impossible to construct; most of those with whom Dickinson would have corresponded lived very close by, and as a result Dickinson's letters are simply insufficient to paint a complete picture of her life. Few other documents remain from which a biography might be constructed. As a result, the life and times of one of America's greatest and most influential poets remains, largely, a source of conjecture. Dickinson died on May 15, 1886. The cause of death was listed as Bright's disease (nephritis). Dickinson's poetry is often recognizable at a glance, and is unlike the work of any other poet. Her facility with ballad and hymn meter, her extensive use of dashes and unconventional capitalization in her manuscripts, and her idiosyncratic vocabulary and imagery combine to create a unique lyric style that is at the same time hauntingly modern. 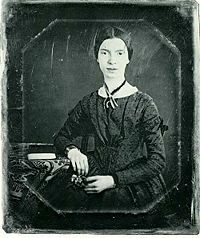 No poet prior to Dickinson, in either England or America, sounded anything like her; her voice was of a distinctly new era, an American revolution in poetry; only Whitman and Poe were anywhere near the kind of poetry Dickinson was composing in her Amherst cloister. Dickinson's poetry, beyond its inventive, almost playful (yet often menacing) tone that calls to mind William Blake's Songs of Innocence and Experience, is characteristic in its highly psychological style. In studying Dickinson's poems it is important to remember her intention: she wrote almost of her poetry for herself and herself alone; had her wishes been carried out, almost all of it would have been destroyed by her kin upon her death. Because of this, Dickinson's poetry speaks with honesty and forthrightness of thought unparalleled in her time and unequalled to this day in its eloquence. The Confessional school of poets that would emerge in America in the 1950s, including such prestigious poets as Sylvia Plath, Robert Lowell, and Anne Sexton would unanimously hold Dickinson as a primary role-model for this reason. During a religious revival that swept western Massachusetts during the decades of the 1840s and 1850s, Dickinson found her vocation as a poet. Most of her work is reflective of life's small moments and some larger issues in society. Over half of her poems were written during the years of the American Civil War. Many suggest that the Civil War gave some of the tense feeling in her poetry. Dickinson toyed briefly with the idea of having her poems published, even asking Thomas Wentworth Higginson, a literary critic, for advice. Higginson immediately realized the poet's talent, but when he tried to "improve" Dickinson's poems, adapting them to the more florid, romantic style popular at the time, Dickinson quickly lost interest in the project. The texts of these early editions would hardly be recognized by later readers, as their extensive editing had altered the texts found in Dickinson's manuscripts substantially. A new and complete edition of Dickinson's poetry by Thomas H. Johnson, The Poems of Emily Dickinson, was published in three volumes in 1955. This edition formed the basis of all later Dickinson scholarship, and provided the Dickinson known to readers thereafter: the poems were untitled, only numbered in an approximate chronological sequence, were strewn with dashes and irregularly capitalized, and were often extremely elliptical in their language. They were printed for the first time much more nearly as Dickinson had left them, in versions approximating the text in her manuscripts. A later variorum edition provided many alternate wordings from which Johnson, in a more limited editorial intervention, had been forced to choose for the sake of readability. Later readers would draw attention to the remaining problems in reading even Johnson's relatively unaltered typeset texts of Dickinson, claiming that Dickinson's treatment of her manuscripts suggested that their physical and graphic properties were important to the reading of her poems. Possibly meaningful distinctions could be drawn, they argued, among different lengths and angles of dash in the poems, and different arrangements of text on the page. Several volumes have attempted to render Dickinson's handwritten dashes using many typographic symbols of varying length and angle; even R.W. Franklin's 1998 variorum edition of the poems, which aimed to supplant Johnson's edition as the scholarly standard text, used typeset dashes of varying length to approximate the manuscripts' dashes more closely. Some scholars claimed that the poems should be studied by reading the manuscripts themselves. Because of her frequent use of common meter, many of Dickinson's poems can easily be set to tunes. Dickinson’s poetry has been used as texts for art pieces by composers such as Aaron Copland and Nick Peros. Blackmur, R. P. "Emily Dickinson: Notes on Prejudice and Fact (1937)." In Selected Essays, edited by Denis Donoghue. New York: Ecco, 1986. Crumbley, Paul. Inflections of the Pen: Dash and Voice in Emily Dickinson. Lexington, KY: University Press of Kentucky, 1997. The Poems of Emily Dickinson. Edited by R. W. Franklin. Cambridge, MA: Belknap Press of Harvard University Press, 1998. The Manuscript Books of Emily Dickinson. Edited by R. W. Franklin. Cambridge, Mass. : Belknap Press of Harvard University Press, 1981. Habegger, Alfred. My Wars Are Laid Away in Books: The Life of Emily Dickinson. New York: Random House, 2001. Johnson, Thomas H. Emily Dickinson: An Interpretive Biography. Cambridge, MA: Belknap Press of Harvard University Press, 1955. Martin, Wendy. An American Triptych: Anne Bradstreet, Emily Dickinson, Adrienne Rich. Chapel Hill, NC: University of North Carolina Press, 1984. This page was last modified on 8 September 2017, at 16:28.